Tháinig athrú mór ar an ainm seo le himeacht aimsire; Cnogba na Sean-Ghaeilge > Crewbane (19ú haois) de réir léarscáileanna na Suirbhéireachta Ordanáis. 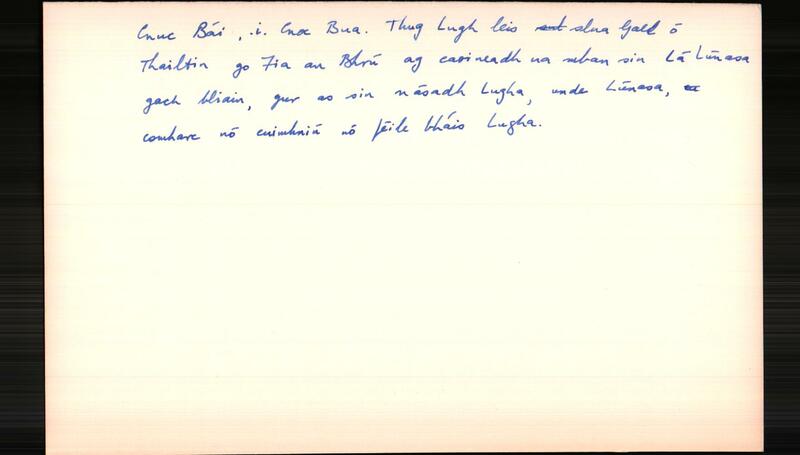 Tá cur síos déanta ag Art Ó Maolfabhail ar an athrú seo in aiste dar teideal ‘Ilfhás ar ainm clúiteach (Cnogba > Knowth, Craud, Ballinacraud, Crewbane)’ in Celtica XXI (1990). Ba é a scríobh Seán Ó Donnabháin faoi fhuaimniú an logainm lena linn féin ná, ‘Cnoghbha is vulgarly pronounced Cru here’. De réir A.J. Hughes, ba é an foghar a chuala an Donnabhánach i logainm seo na Mí ná guta atá le fáil i gcanúintí Ultacha ar a dtugtar ‘high-back-unrounded u-sound’ (Ainm IV, 1990). · Desc. Rem. :AL, Mí075,14 "Near the centre of the townland is a large fort."